Delicate pink flowers adorn the sand dunes at Otterswick. Low growing succulents, these hardy plants thrive in the dry sandy conditions on the fringes of the beach. Showered in sea salt and buried by the abrasive sand which is moved by the continuous winds, these plants bring a gentle colour to the dunes. They have four petals on each flower, clustered on a tall stem . These can be any colour from white through pink to a deep lilac and attract bees, flies, beetles and moths. They grow throughout the sand dunes with long tap roots. Plants intermingling with each other as they wind their way across the dunes. 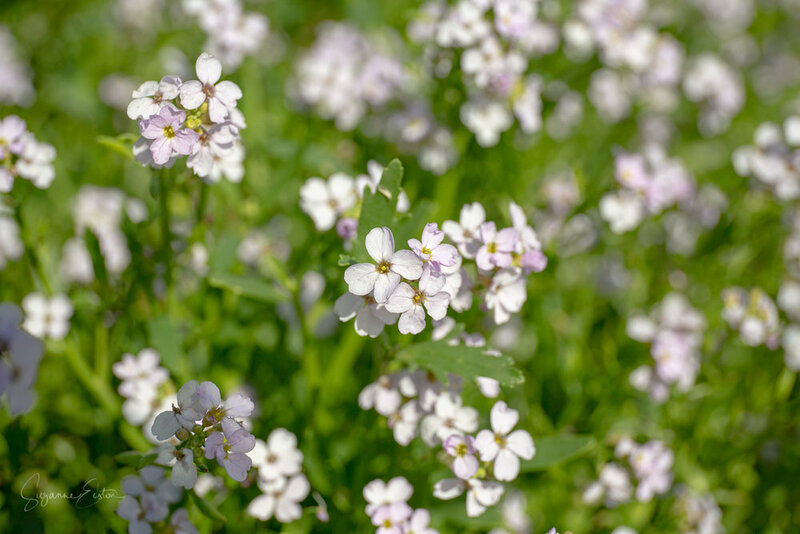 The sea rocket (Cakile maritima) appears each year, an annual that has large seed heads. These seed heads remain on the plant until the seed is shed, being spread by the sea to other beaches. When the plant is buried it will produce even more seeds and grow more vigorously to ensure its survival. Such a pretty plant in a hostile environment, it can be used for cooking and contains loads of vitamin C! Sea rocket is abundant on many of the beaches on Sanday and across the U.K.. It grows in the dry sand dunes, just above the high tide mark. Look for succulent green leaves with the delicate pink flowers from June to August and the seed heads in August and September.